Climate change today represents an onerous challenge to legal responsibility across geographical and inter-generational boundaries. Both the environmental as well as the social effects of global climate change are necessitating a re-imagination of the extant legal regime. With the rise of sea levels, storm-surges and inundation of the mainland, countries the world over will soon be faced by an enormous, previously unimaginable climate-induced human displacement crisis. To make matters worse, this issue of climate-induced migration is conspicuous in its absence from international legal instruments. The threat of migration is especially grave for the Pacific Island nations, whose territories have already begun to be submerged. The Carteret Islanders, in 2003, often referred to as the world’s first climate change refugees, had to be evacuated due to the rise in the sea level. For the populace ofsuch low lying coastal communities, migration seems to be a distinct possibility, with their predicament only being magnified by the loss of their spiritual ties with their land and the impossibility of ever returning home. The problem of the climate refugees is however not limited to the Pacific Islands. Countries such as the Maldives, Bangladesh and Ethiopia are also struggling to cope with the consequences of the rise in sea levels. By 2050, approximately 150 million people are expected to be displaced by climate change. Thus, the need for an adequate and appropriate response of the global community is required to protect and assist those faced with forced displacement, premised upon notions of planetary loyalty and humanitarian concern. 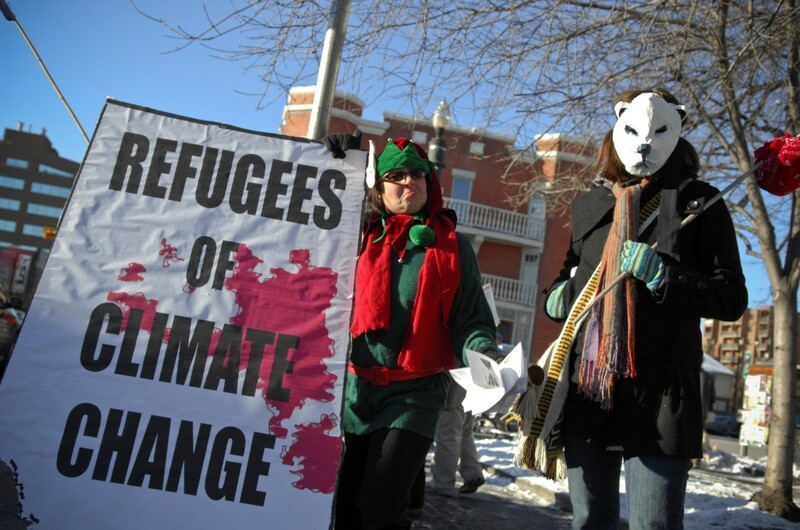 A protest in Calgary on the predicament of Climate Change Refugees on the occasion of the International Day of Action on Climate Change. However, these ‘climate refugees’ as they have come to be known (though the terminology itself is hotly contested, with alternative phrases such as climate-induced migrants, environmental refugees and so on being suggested) are currently devoid of any remedy in international law. The UN Refugee Convention does not recognize this class of people as ‘refugees’since climate/environmental causes are not enlisted within the Convention. For instance, Ioene Teitiota from the Pacific Island of Kiribati (an island-facing inundation), who sought asylum on grounds of persecution due to climate change, was refused the same by the New Zealand Supreme Court owing to the above short-coming in the Convention. One of the proposals that was tabled in the preliminary drafts of the negotiating text of the 2015 United Nations Climate Change Conference (COP 21) was that of a ‘Climate Change Displacement Coordination Facility’ (hereinafter Displacement Facility). Though there is no clarity yet on the functioning of this set-up, the facility would primarily deal with displacement, migration and planned relocation of people whose livelihood and very existence are threatened by climate change. The proposal could not however find adequate public discussion and attention in the final agreement of COP 21 owing to its focus on other complex discussions hinging on limiting GHG emissions and preventing disastrous consequences of ‘anthropogenic interference with the climate system’. The rising magnitude of people at risk due to rising sea levels and other rapid-onset and slow-onset climate events make the issues surrounding climate-induced migration and the Displacement Facility too grave a topic to be left at minimal discussion. Although the Displacement Facility has re-surfaced in the discourse on climate change, certainty on its functional mechanism and the corresponding legal framework to address the practicalities surrounding its operation is still lacking. The Paris Agreement without using the phraseology ‘Climate Change Displacement Coordination Facility’, has ‘requested’ (clearly in a non-binding manner) the Executive Committee of Warsaw International Mechanism to take the lead on operationalising the climate related displacement through a task force. However, the outcome of this stipulation is obscure since it is placed under the head of ‘Loss and Damage’ instead of ‘Adaptation’ thus making it difficult to establish its locus to demand funds under the Green Climate Fund and United Nations Framework Convention on Climate Change (UNFCCC) Adaptation Fund. Hence, the demand for alternate funds,especially when pinned on the argument of largest contributor of greenhouse gases to pay the most would be problematic after the withdrawal of the US (one of the largest emitters) from the Paris Agreement. In order to develop a framework to ensure the functioning of the Displacement Coordination Facility, the UNFCCC could be made to work in tandem with the UN Security Council. The Security Council herein could ensure compliance by exercising its powers under Article 39 of the UN Charter. However, its exercise is conditional upon the existence of threats and breach of peace, and acts of aggression. Hence, such a suggestion seems presumptuous of the role of the Security Council. Further, the situation has been complicated after the withdrawal of one of the Security Council members from the Paris Agreement dissipating the likelihood of reaching a consensus on imposing sanctions in cases of non-compliance. Therefore, it is important for having a clear mechanism on how the Displacement Facility operates with increasing climate-induced internal displacement and the threat of the Pacific Islands being submerged within a few decades. However, the Displacement Facility would only be able to tackle the urgent imperatives of relocation and rehabilitation of the climate-refugees. In the long run, an international treaty framework which accords recognition to ‘climate refugees’and which requires countries to accommodate them within their territory is required. The definitional problem will persist given the resistance from the stakeholders (the United Nations High Commissioner for Refugees in particular) to extend the protection under the 1951 Convention to climate-induced migrants. Therefore, alternative international actors and legal frameworks are required to be assessed to identify the best positioned one(s) to address this emerging, yet inevitable, concern. Given the contemporary paranoia towards refugees, it would be expedient to consider establishment of the Displacement Facility at the earliest in order to tackle the short-term requirements of the climate refugees, while stretching the limits of international law to accommodate these refugees in the long run. Phillip Dane Warren, ‘Forced Migration after Paris COP21: Evaluating the ‘Climate Change Displacement Coordination Facility‘, https://www.jstor.org/stable/44028186. Maria Jose Fernandez, Refugees, ‘Climate change and International Law’, fmreview.org/climatechange-disasters/fernandez.html. Ameen Jauhar, ‘The Nowhere People’, thehindu.com/opinion/op-ed/The-nowhere-people/article16765025.ece. John Vidal, ‘Global Warming could create 150 million ‘Climate Refugees’ by 2050’, https://www.theguardian.com/environment/2009/nov/03/global-warming-climate-refugees. Jessica Wentz & Michael Burger, ‘Designing a Climate Change Displacement Coordination Facility: Key Issues for COP 21’, law.columbia.edu/sites/default/files/microsites/climate-change/unfccc_climate_change_displacement_coordination_facility.pdf?utm_content=bufferbc5b7&utm_medium=social&utm_source=twitter.com&utm_campaign=buffer. Ad Hoc Working Group on the Durban Platform for Enhanced Action, ‘Working Document’, int/files/bodies/awg/application/pdf/adp2-10_8sep2015t1500_cwd.pdf. Neil Tweedie, ‘The World’s first Climate Change Refugees’, telegraph.co.uk/news/earth/carteret-islands/6752962/The-worlds-first-climate-change-refugees.html. ‘United Nations Framework Convention on Climate Change’, int/files/essential_background/background_publications_htmlpdf/application/pdf/conveng.pdf. *Rudresh Mandal and Hardik Subedi are 3rd year students, pursing their BA LLB (Hons.) at NALSAR University of Law, Hyderabad. They take keen interest in the intersection of environmental law and human rights. This entry was posted in Activism, Environment, Humanitarian Emergency, Law, Refugees and tagged Activism, Environment, humanitarian emergency, International law, Refugees. Bookmark the permalink.